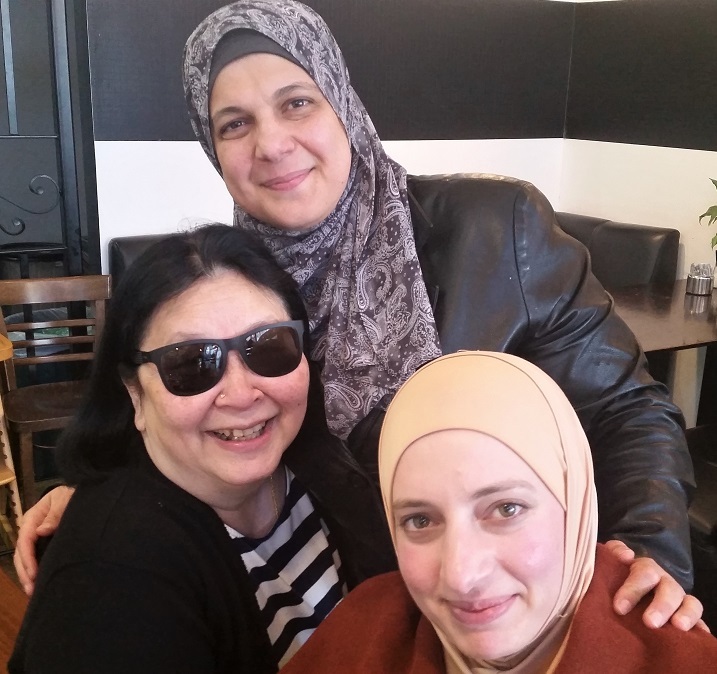 Mona Yahy and Habiba Orabi sit side by side in a busy Lower Hutt café talking about the bonds they’ve made and the things they’ve learnt since they left Syria to escape the horrors and impossibilities of war. They’re sharing coffee and cakes with their friend, and E Tū Whānau kaimahi Pohswan Narayanan. Forty-five-year-old Mona is a warm, vivacious woman who tosses her head when she laughs – and she laughs a lot. She talks quickly in English, her third language after Arabic and French. She started learning English 28 months ago when she, her husband and three teenage children arrived in New Zealand. Her youngest son is deaf so she’s learning sign language as well. Habiba who is younger, has heard the evocative introduction before and enthusiastically leans forward to join the conversation. She’s keen to practice her English and talks about the benefits of attending one of the two Pathways to Successful Resettlement and Employment courses organised by Pohswan through the Upper Hutt Multicultural Council. “The Pathways course got us to think about what we wanted and how we could get there. We set goals. First, we must learn English. So, I go to classes three days a week,” says Habiba who is starting to see a career as an early childhood worker as a distinct possibility. E Tū Whānau funds the Upper Hutt Multicultural Council to support Syrian communities as they resettle in the Hutt Valley. Pohswan manages that relationship. She encourages refugees and migrants to tell her what they need to help them settle into their new lives then designs learning opportunities, like the Pathways course and an equally successful self-defence course. She also organises group outings that are often hilarious and liberating to places like the go-kart raceway and the local bowling alley. Mention of their go-karting adventure has both Habiba and Mona laughing and talking over one another as they describe the fun they had and the freedom they felt behind the wheel. For Mona, it was a transformative experience. While Mona appreciated the break from her domestic responsibilities, she remains devoted to her whānau and is extremely proud of her three children. Her 17-year-old son Radwan and his 15-year-old sister Alaa are high achieving and award winning students at Naenae College. After attending a course in public speaking, Radwan spoke at a recent Parliamentary function marking World Refugee Day and remains keen to share his story with more kiwi audiences. Their 11-year-old brother Abodi is a student at Epuni Primary School. Mona, who was a pharmacy assistant before she married, is now clear that she is going to perfect her English and her sign language then train to be teacher of deaf children. Mona is excited about her future. She credits the Pathways course, and the support she received from Pohswan and the other gutsy, refugee women she’s befriended through the course with helping her identify her goal and the pathway to achieving it.